Introduction: Titanium dioxide (TiO2) nanorod and nanowire structure are an important material in photocatalytic and photoelectrocatalytic application. But, photocatalytic performance of TiO2 nanostructure was limited by electron-hole recombination. The surface adsorbed hydroxyls on TiO2 surface play an important role in photocatalytic and energy applications. It increases the trapping site for electron and hole and prevents its recombination. Materials and Methods: Herein, TiO2 nanorod array (NRA) was synthesized on FTO substrate with the facile hydrothermal method. The existence of the surface adsorbed hydroxyl group on the TiO2 surface was studied by performing different calcination treatment on synthesized TiO2 NRA. Results: X-ray diffraction (XRD) revealed that synthesized TiO2 NRA has only rutile phase. Field emission scanning electron microscopy (FE-SEM) showed that the morphology of nanorods array is grown on FTO substrate. The optical properties of TiO2 NRA were studied using UV-Visible spectrophotometer and Photoluminescence (PL). The existence of surface hydroxyl group was estimated by X-ray photoelectron spectroscopy (XPS). 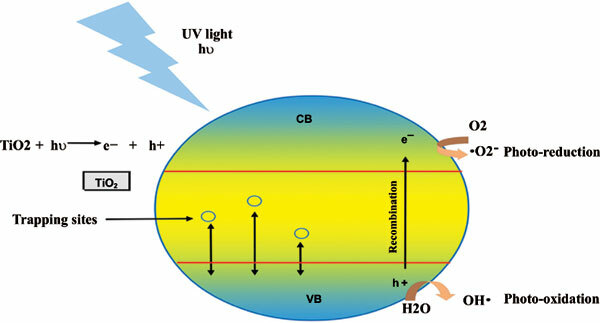 The photocatalytic efficiency of the obtained TiO2 NRA was investigated by the photodegradation of methylene blue under UV light irradiation. Conclusion: The effect of calcination and growth time of as-synthesized TiO2 NRA and its photocatalytic activity were also studied. The TiO2 NRA treated with low calcination temperature showed higher photocatalytic activity. Titanium dioxide (TiO2), surface hydroxyl group, nanorod array, hydrothermal method, photocatalytic activity, UV light.